In order to reflect the evolution of computerized recording techniques since the Digital Epigraphy Manual’s release in 2014, the Epigraphic Survey initiated an update of its digital documentation guidelines. 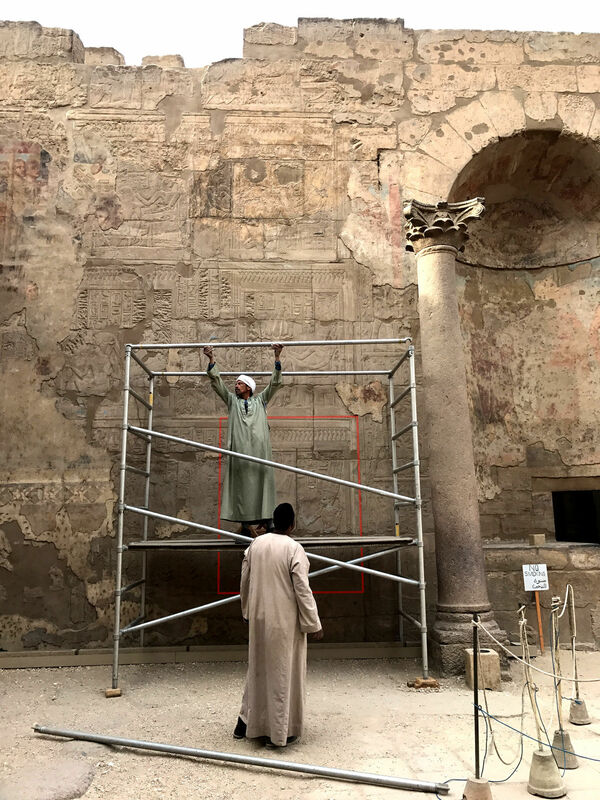 The venue selected to demonstrate these new tools and techniques was Luxor Temple, where recording of the late Roman murals in the Emperor’s chamber has already produced promising results. 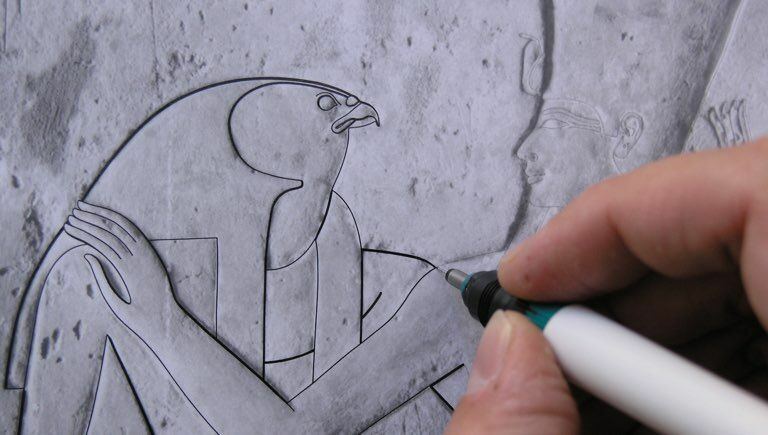 W. Raymond Johnson, director of the Epigraphic Survey, chose a sample scene based on the Survey’s plan to publish the Pharaonic reliefs within the same chamber. Photographic documentation of the Roman paintings was already complete, both in film and in digital format. 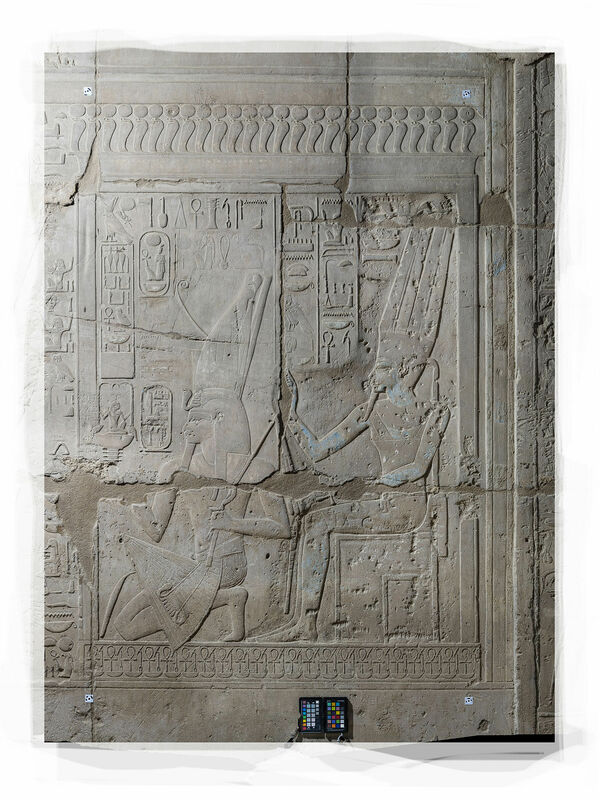 Suitable contemporary photographs of the pharaonic reliefs, however, were not yet available. As the fresco documentation progressed on the southeast wall, much of the area surrounding the Roman painted remains was also incorporated into the drawings for contextual purposes, using the regular Chicago method. Most of these drawings were penciled in the traditional way, by being drawn on photo enlargements, and were only transferred to digital format during the inking procedure. For this reason a drawing of a single wall segment to be created digitally from the beginning required a method fully compatible with the existing documentation system. 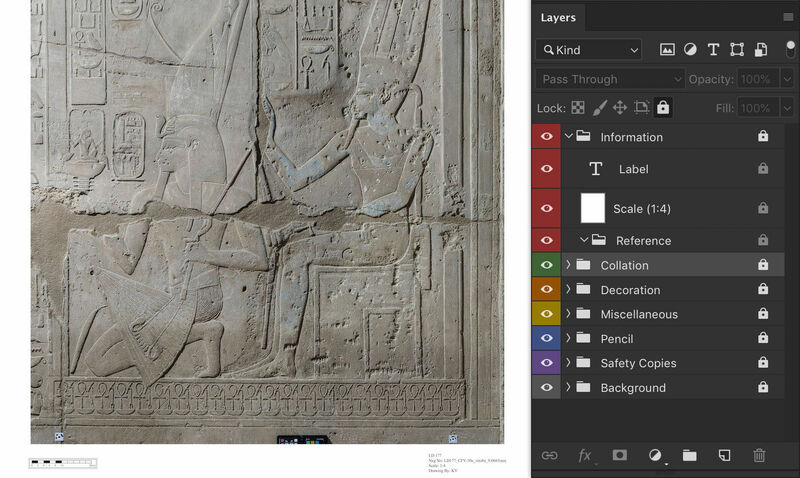 The selected scene was registered as “LD 177” according to the Nelson numbering system for Luxor temple. 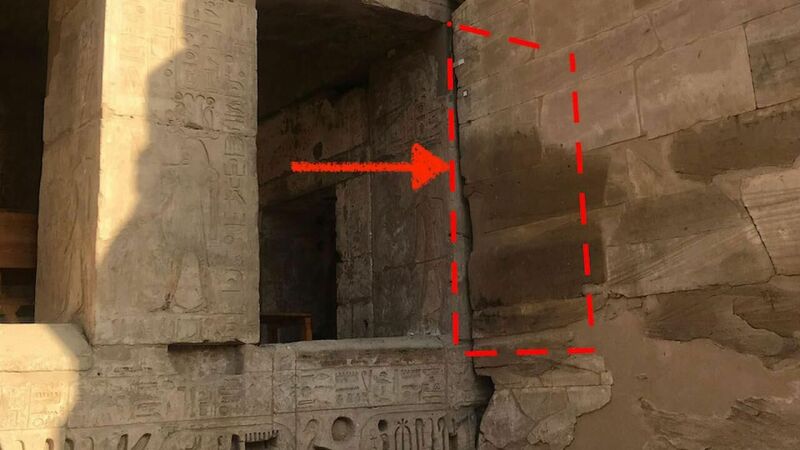 LD 177 is located in the first register of the southeastern wall of Room V at Luxor Temple, also known as the First Antechamber, Roman Vestibule, or Chamber of Appearances. The scene selected for documentation holds special interest for scholars because it was altered numerous times in antiquity. 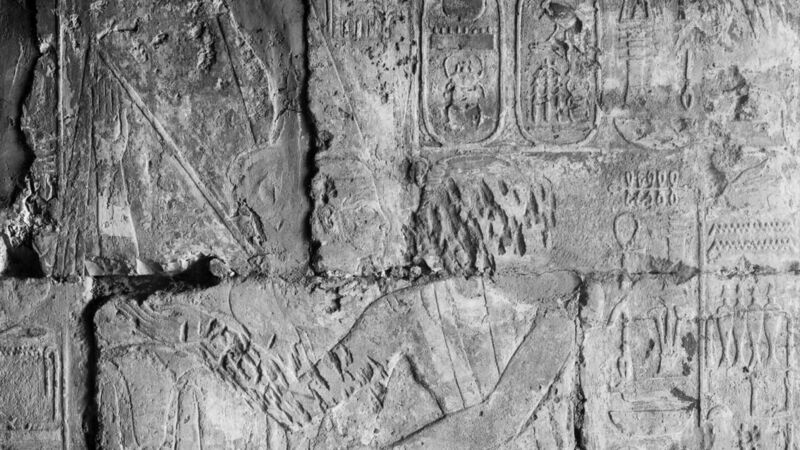 The scene shows the king and the enthroned Amun-Re in a kiosk, which is decorated with a line of uraeus serpents with sun discs on top. 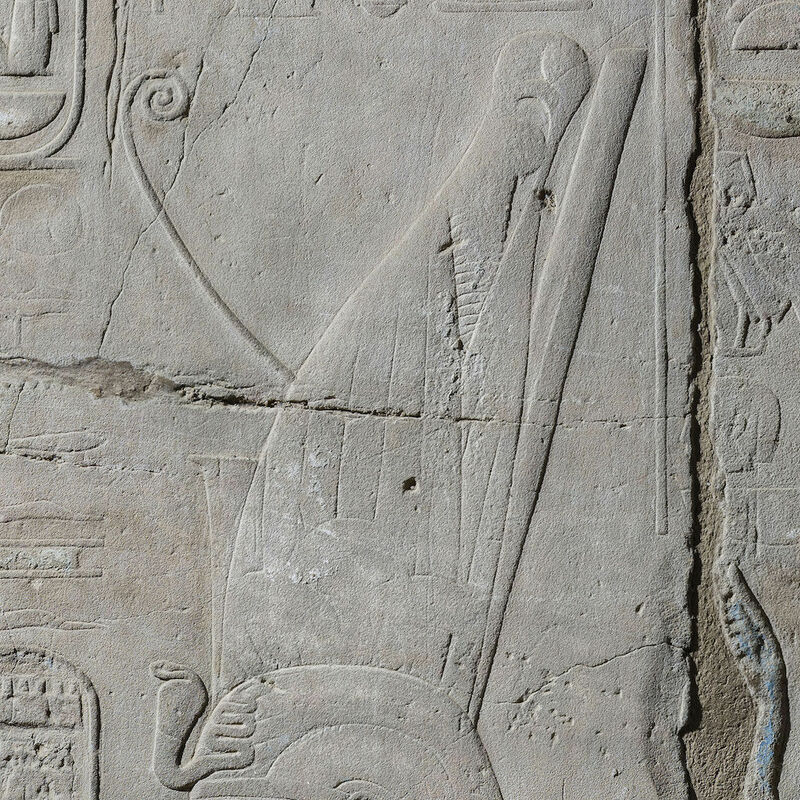 Amenhotep III, carrying a heqa-scepter and flail, kneels before the kiosk, facing away from Amun-Re. 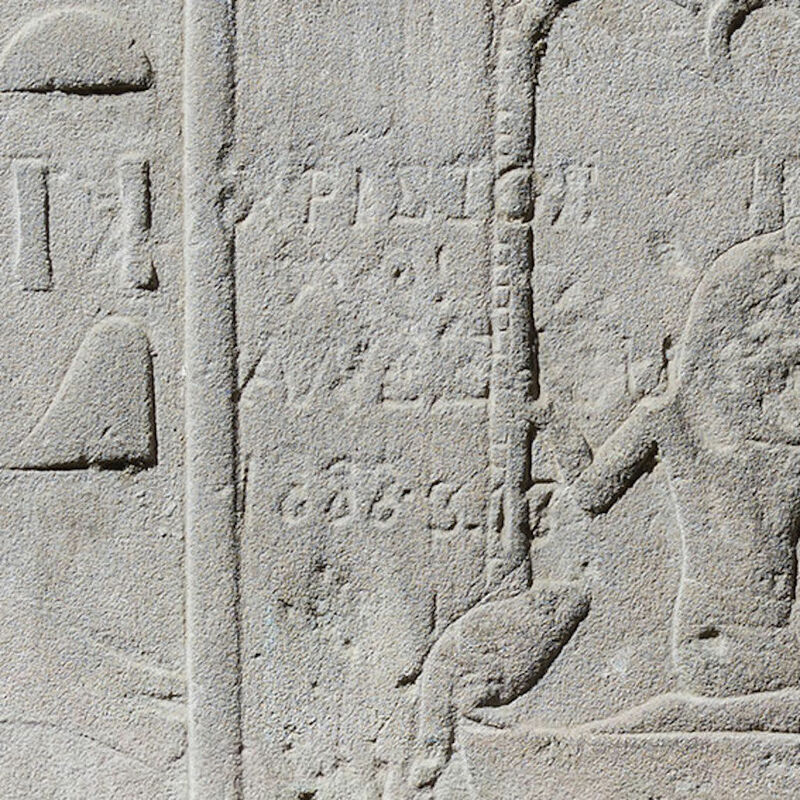 In his other hand is a djed-pillar topped with a basket and an elaborate heh-figure grasping renpet-signs, which is now partially lost in damage. The king wears a triangular kilt with a sporran, a bull’s tail, an elaborate usekh-collar, and a beard, and bears the double crown on top of a nemes. 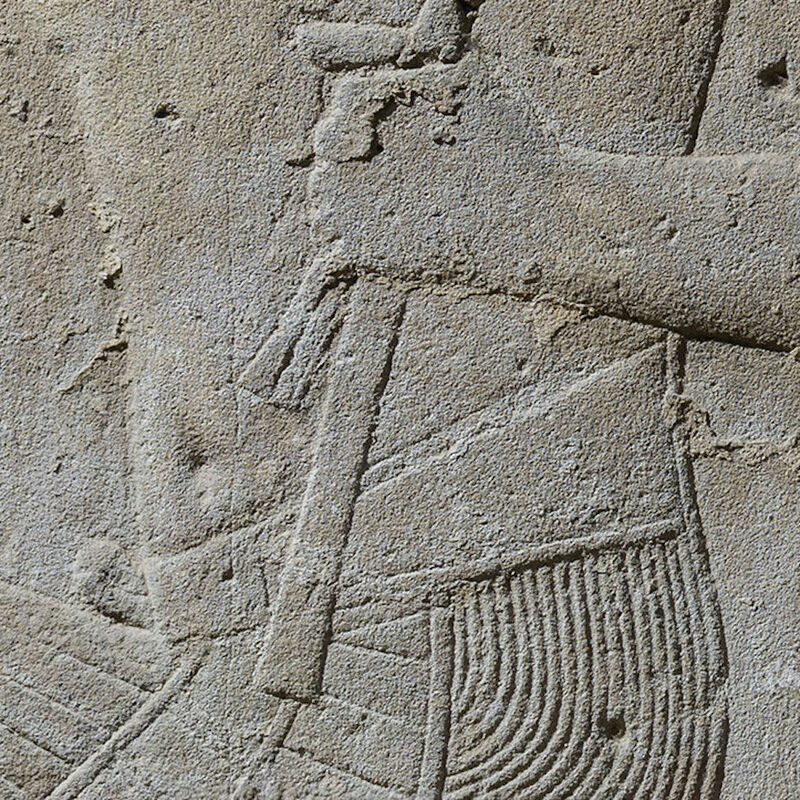 Amun sits on a throne in the kiosk behind him and raises his right hand to support the king’s crown, while holding an ankh over his thigh in his other hand. He wears the standard fitted costume, which extends above the waist to the god’s pectorals and is held in place with shoulder straps. He also wears a bull’s tail, a broad collar, the divine beard, and the standard double-feathered crown. There are shallow traces of an earlier, more elaborate diadem to be found on and around the king’s crown, and modifications to the appearance of the textual content as well. 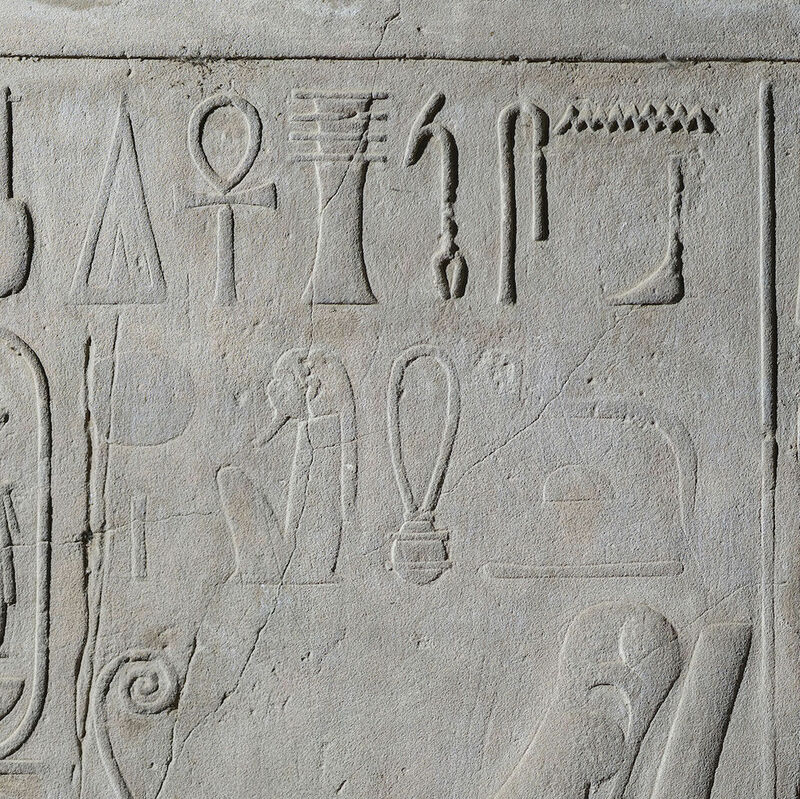 These accompanying texts record the coronation of Amenhotep III by the deity. 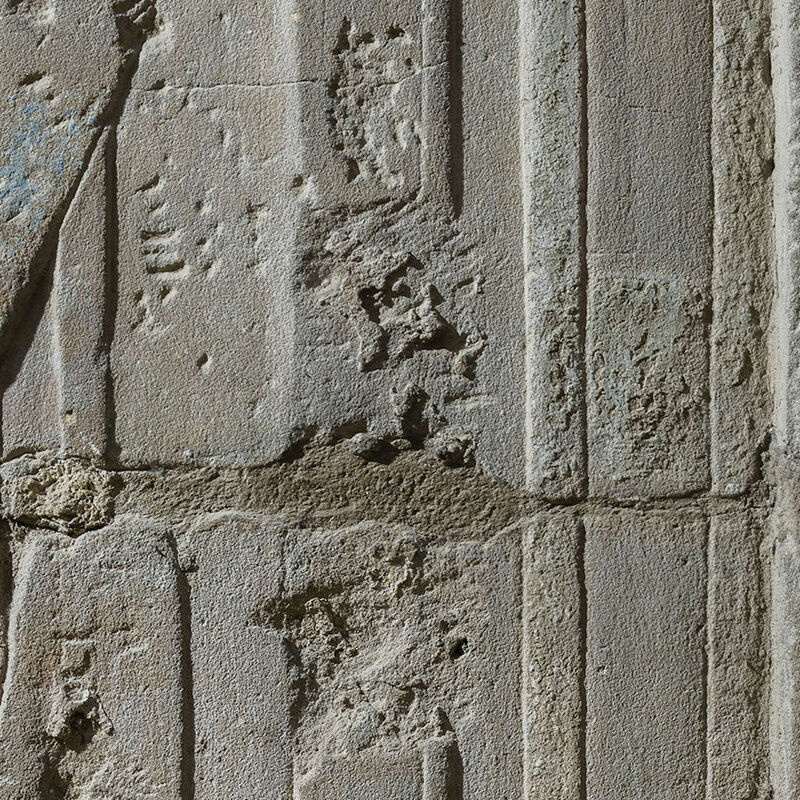 During Amenhotep III’s reign, numerous modifications were made to the scene, especially to the crown, as mentioned above. Although the form of the original crown can be perceived from the remaining traces, the reason for its alteration is unclear. Some have explained it as an error made during the initial carving of the scene that was later corrected, while others have argued that the contemporary changes were intentional and designed to emphasize the power and divinity of the king. There are, however, modifications observable on the king’s figure, including the lowering of the king’s belt and kilt, modification of his broad collar, enlargement of his foot, and shifting his hand. Such subtle modifications can be easily overlooked, making the need for accurate epigraphic documentation even greater. (1)Traces of the earlier version underneath the double crown worn by Amenhotep III. Traces are present within the crown area and on the nemes, but are mostly lost around the crown due to recessing of the surface. (2)Certain parts of the text seem to be much shallower, suggesting that they are later additions connected to the modification of the crown. 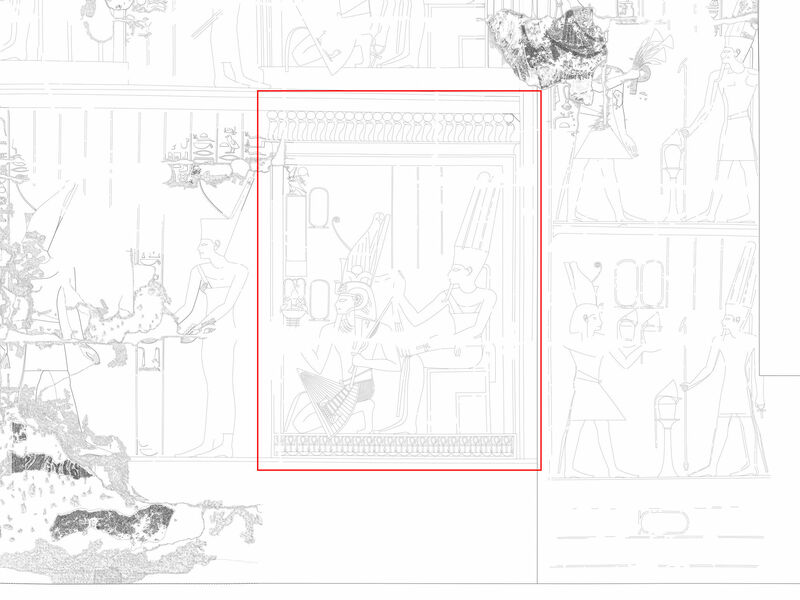 (3)Subtle shifting of specific elements of the king’s costume indicate slight alterations in the documentation program, which probably occurred within the reign of Amenhotep III. (4)Traces of color can be found on numerous elements of the scene, but unfortunately none of the fine painted details have been preserved, due to the wall being exposed to the elements. 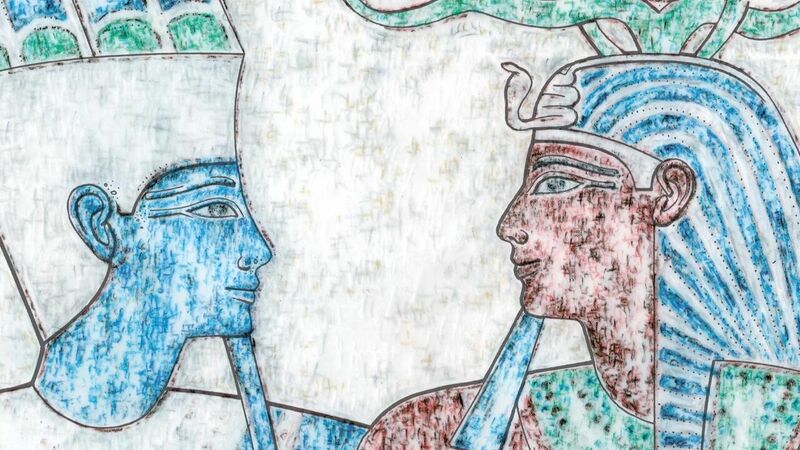 (5)Modifications visible on Amun-Re’s double feathered crown along with particularly deep Amarna chisel marks still visible on the recessed surface. 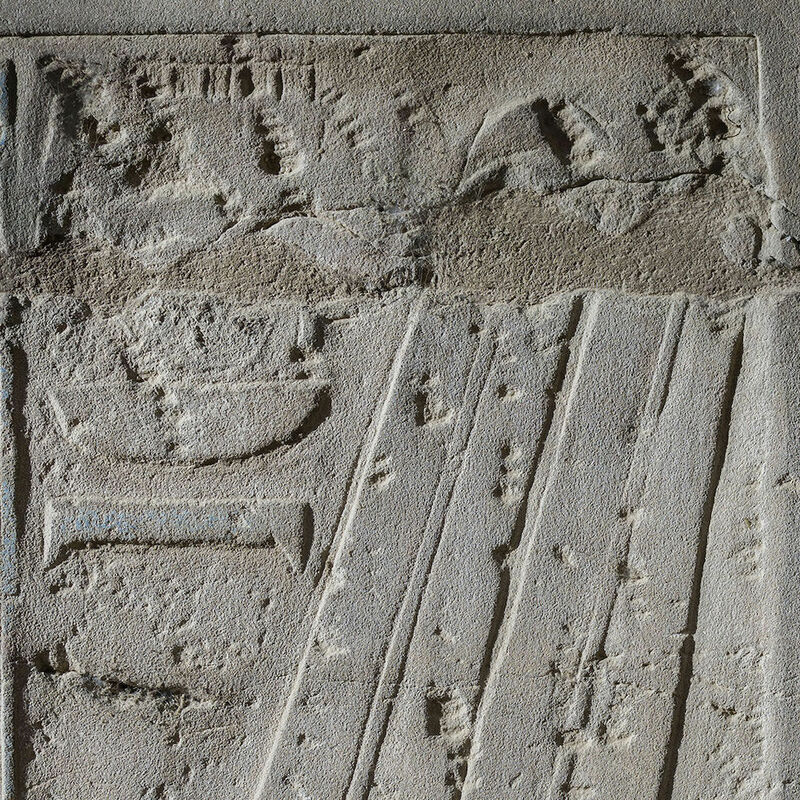 (6)Shallow undulations on the kiosk’s vertical walls alongside some chisel marks suggesting the removal of some of the missing painted elements once present on the surface. 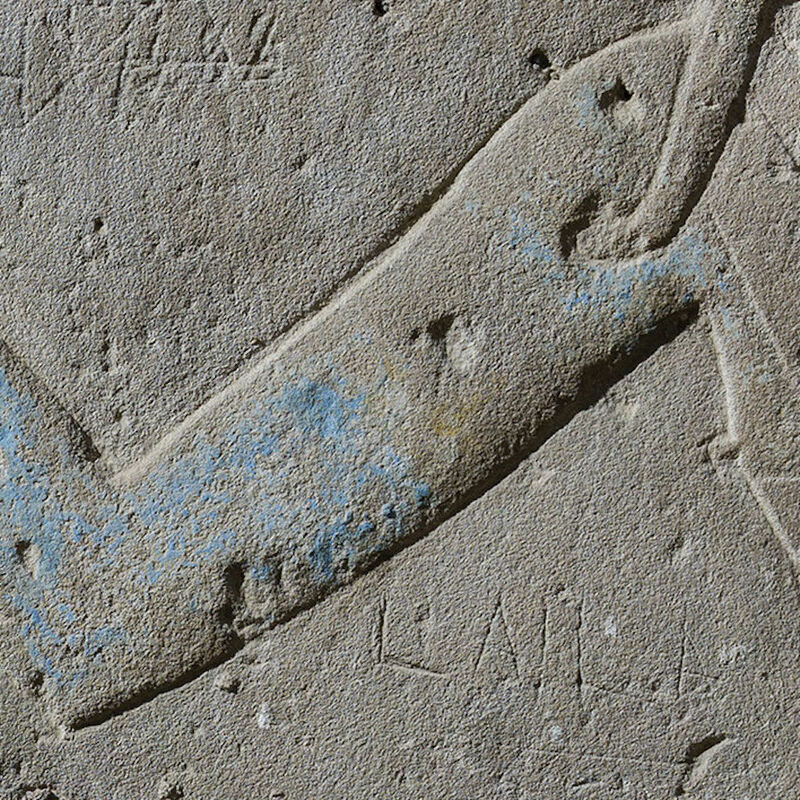 (7)One of the three traveler’s graffiti preserved over the heh-figure, comprising yet another layer of information related to LD 177. 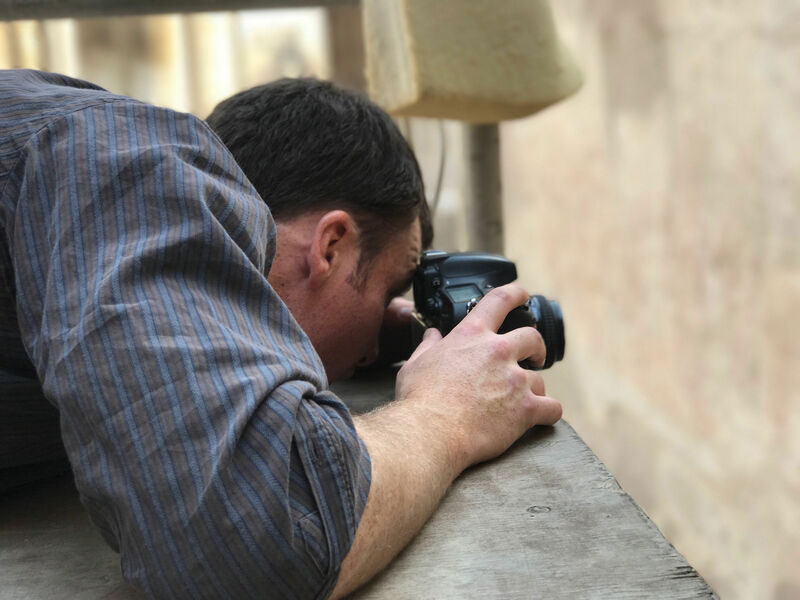 At the release of our new website, digitalEPIGRAPHY provided a lengthy article about the Epigraphic Survey’s approach to introducing digital tools in field documentation. Although these guidelines were laid out a couple of years ago, our standpoints regarding hardware and software solutions and the main goals and attributes of field epigraphy are just as valid today as they’ve ever been. 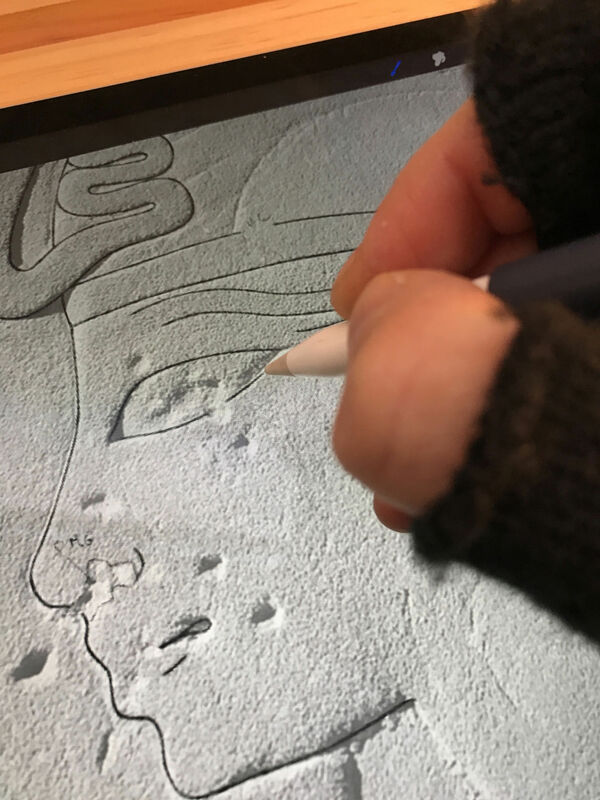 The inevitable evolution of these digital devices, however, has rearranged and simplified the suite of tools and methods required for creating our initial drawings at the wall. 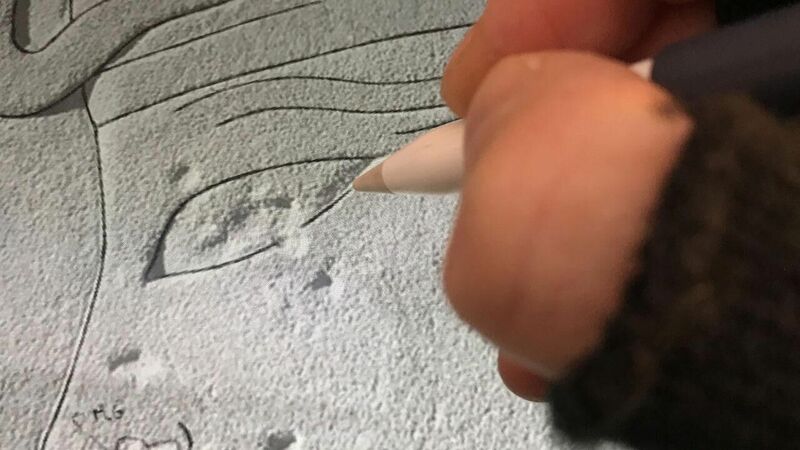 This is clear when comparing past experiences with Wacom’s tablet solutions with today’s field drawing process, which relies largely on the Apple iPad. 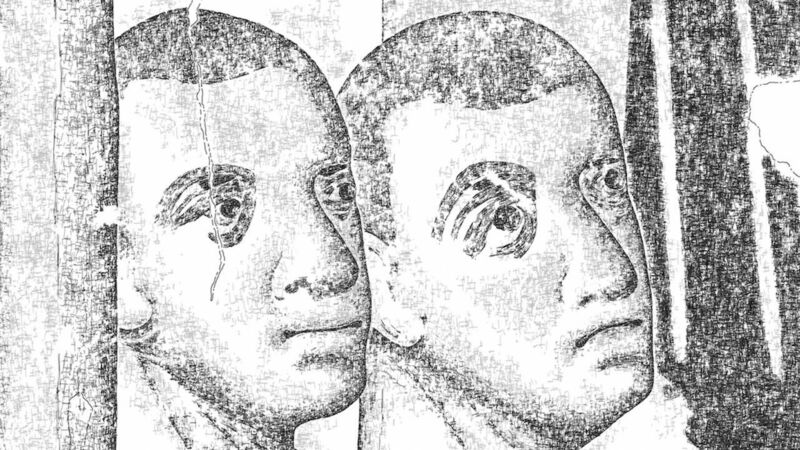 Nonetheless, digital “penciling” in the field still requires a certain set of preparatory steps on the part of both photographer and artist, as will be demonstrated for the sample scene LD177 in the next segment. Digital image creation and processing have evolved immensely in the past few years, bringing a plethora of new solutions that can be considered as a digital substitute for creating backgrounds for field documentation purposes. One of the most promising technological achievements that can be utilized in documenting wall scenes is the commercialization of photogrammetry. 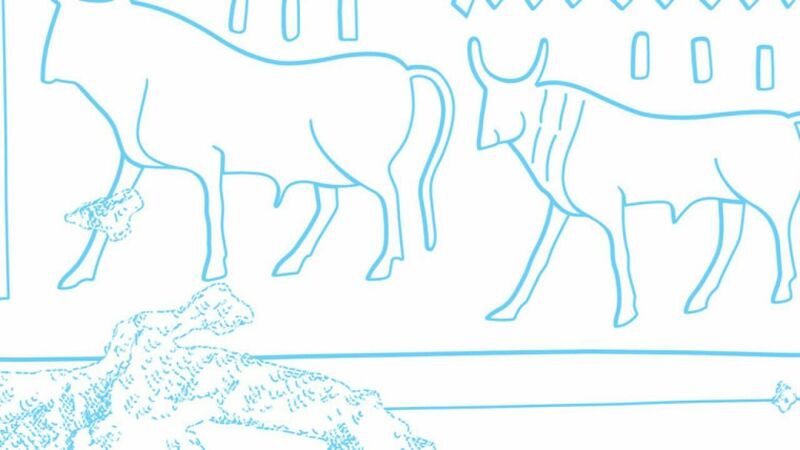 The software implemented by the Epigraphic Survey is provided by Agisoft, and is known as Agisoft PhotoScan. It is a standalone PC/Mac program that enables photogrammetric processing of digital images and generates 3D spatial data to be used in GIS applications, cultural heritage documentation, and visual effects production. Furthermore, it can be applied for indirect measurement of objects of all sizes, using various single-camera setups. One can learn more about the various uses of PhotoScan by reading its manual or studying the numerous detailed reviews online. For our sample scene, Owen Murray has provided a detailed description of the specific photogrammetric method developed to deliver the necessary high-resolution photographic background for LD 177. 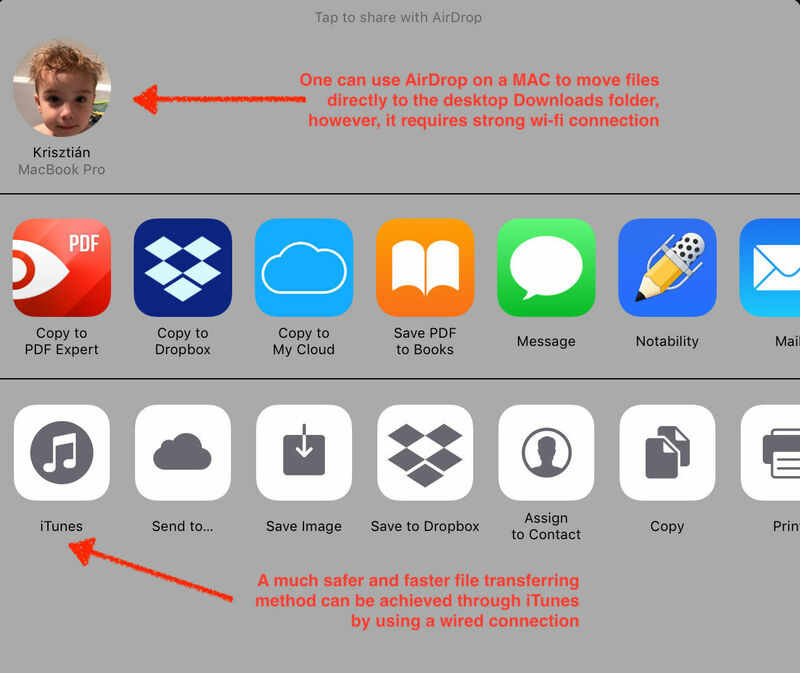 A detailed description of the method can be found in our Tutorial section, but a short list of the necessary steps applied during the process is given below. Initial site evaluation: identification of scene, material preparations, hazard identification, coded target placement (best possible placement for series of long horizontal, vertical and diagonal measurements). File nomenclature conventions; archival imagery image search. Determine level of detail: what are the archival standards; file size, type, metric units? Is a specific scale required; 1:4, 1:5, 1:10? Is a specific resolution required; 72dpi, 300dpi, 1200dpi? What is the final output; tablet/desktop, print publication, 1:1 museum duplicate? What cameras are available: Large format, Medium format, DSLR, iPhone/Tablet? Determine camera positions and lighting setups. Coded target placement and measurement, whether by hand using a tape measure in 2 dimensions (x,y), or using a topo station or the like, providing coordinate location in 3 dimensions (x, y, z). Regardless of measurement method, record all information in a notebook for future reference. Field Photography; acquiring photographic images required to build both structure (skeleton/musculature) and texture (skin) of the scene for documentation purposes. Post-Processing; RAW file treatment and image adjustments. PhotoScan model build; orthomosaic generation, patch modifications and export for initial field drawing. 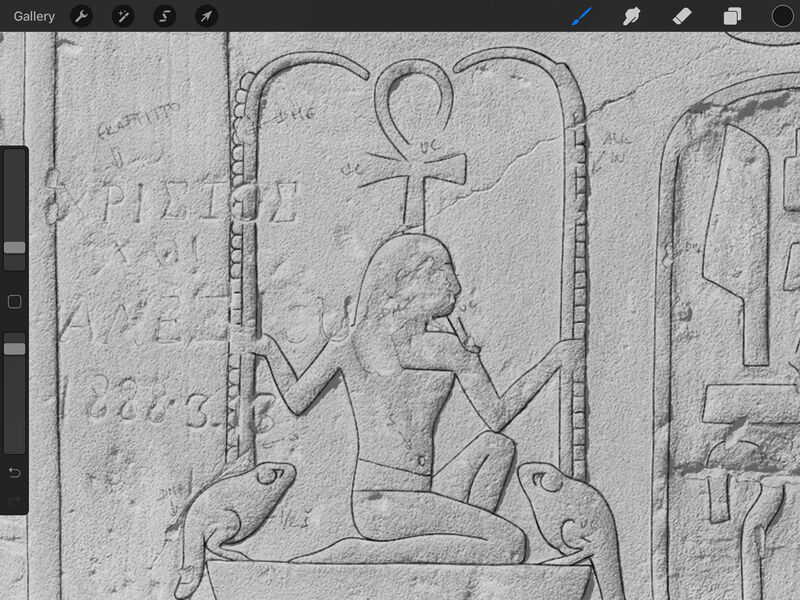 When incorporating photogrammetry into the epigraphic process, the Survey’s artists don’t need to generate their own digital backgrounds based on scanned film negatives. Instead, they are now provided with the PhotoScan montage of the relevant scene created by the photographer. This image is a perspective-corrected orthomosaic (a raster image made by exporting orthophotographic data from PhotoScan) of the scene output at 1200dpi. 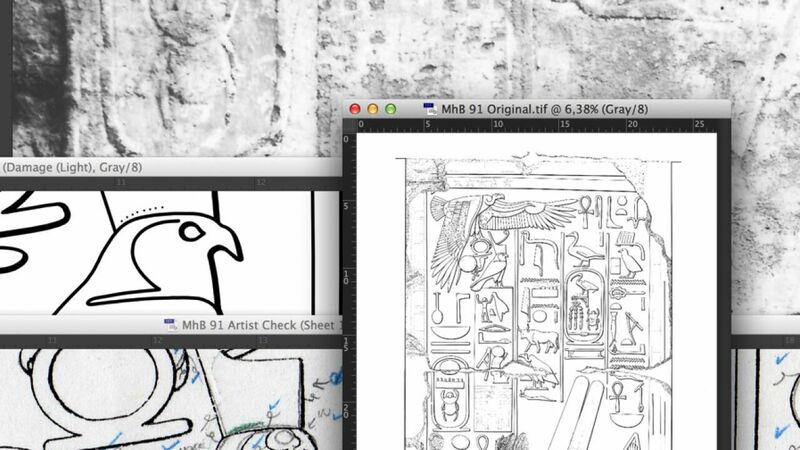 The background image that the artist receives for digital penciling is now rendered in full color and must include a physical scale for measurement and scaling purposes. 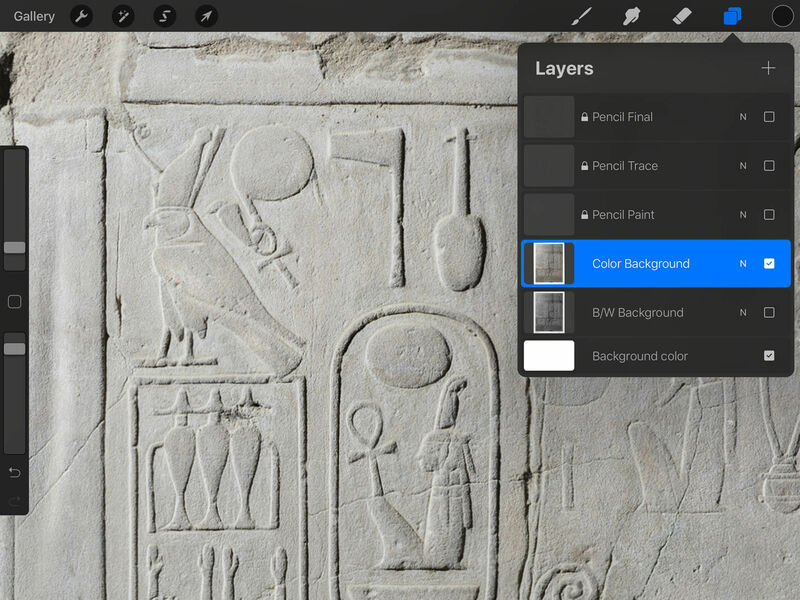 Naturally, with the color information preserved, the digital image provides a much more accurate background for documenting walls with lots of painted details. In accordance with this new system, once the appropriate photo background was received, LD 177 needed to be prepared for digital penciling. Thanks to the Survey’s sophisticated and constantly refined set of digital templates, creating the digital background has become a much simpler, more straightforward affair, especially in comparison with some of our previous digital projects. First, the orthomosaic output image needed to be incorporated into the relevant template, reflecting the appropriate scale and resolution of 1:4 at 1200 dpi. 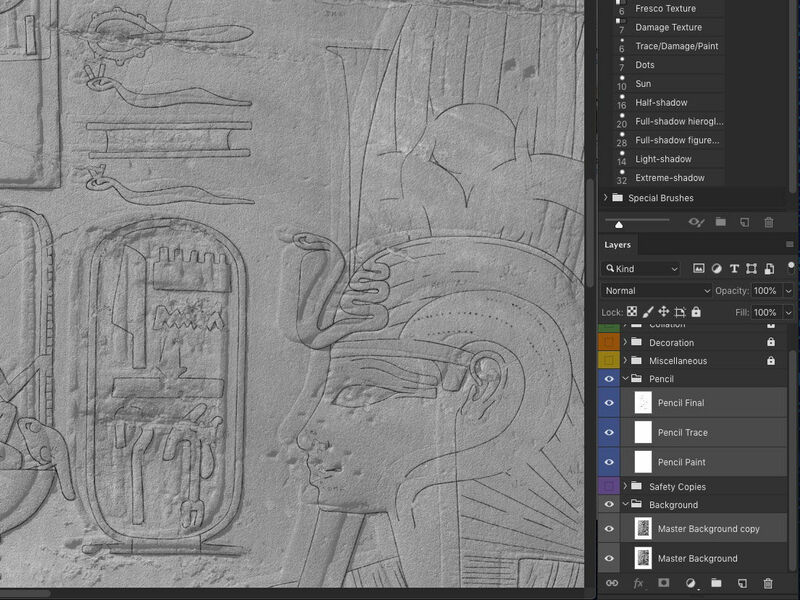 The Epigraphic Survey’s preset canvas templates are available in numerous versions ranging from 1:5 to 1:2, dictated by the size and density of the decorative elements they accommodate. These preset blank canvases (1200 dpi tiff files) have a uniform layer structure, advancing the information to be captured onto layers and sub-layers arranged into color-coded collective folders. A quick comparison of the physical scale on the photograph with the digital scale provided in the template guarantees that no further intervention is needed on the part of the artist during the initial setup process. Folder arrangement for LD177 shown on the right, with the Information folder revealing its layer content. Once the template canvas was properly cropped and adjusted to accommodate the background image (named Master Background), the file was saved as a lossless TIFF image. Every subsequent alteration of the drawing, starting with the background set up for digital penciling, derives from this Master Image file, preserving the exact aspect ratio and canvas layout to provide seamless transition between Mac and iPad. We gave a detailed first impression of the iPad’s advantages and shortcomings in our Digital Epigraphy manual and - for better or worse - a couple of years later, the information we provided at that time is still essentially correct. The iPad Pro’s hardware has certainly become more powerful, and the software has received a few tweaks over the years. 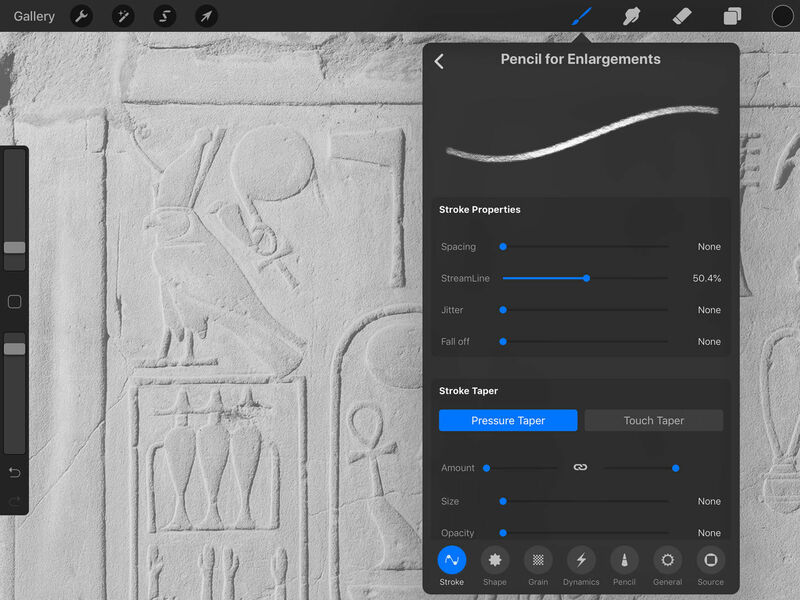 One must nevertheless still expect a few workarounds to be necessary when dealing with large, multilayered files on the iPad, since popular drawing apps, such as Procreate, still limit their maximum canvas size to 16k by 4k pixels. Our LD177 Master Image, as it was set up with the 1200dpi template, was 20k x 27k pixels, so the file either had to be cropped into smaller sections or reduced to a lower resolution before the drawing process could be initiated on the iPad. Keeping the original resolution would have meant penciling on numerous smaller drawing segments with overlaps necessary for reassembly. Instead, we decided to downgrade the resolution of the Master Image file to a manageable size to be able to preserve the integrity of the original canvas on the iPad. Working backwards, experimenting with the maximum resolution that could still be transferred to Apple’s tablet (while still accepting the required number of layers necessary for penciling), we ended up downsizing LD 177 to 300 dpi, which translated to 5305 x 7205 pixels. In the next step, the file was flattened (Layer/Flatten Image) and saved as a JPEG at maximum quality. The result was then transferred to the iPad Pro via iTunes and was ready for digital penciling. As we considered the digital environment to be used for our reference scene’s initial field documentation, Photoshop and Procreate were the two candidates that emerged from the relatively large pool of available Mac OS and iOS solutions. In the end, Procreate was chosen for the task, not only because drawing in a standalone, native iPad application would simplify our workflow tremendously, but also because its cleaner user interface proved to be more suited for digital penciling. 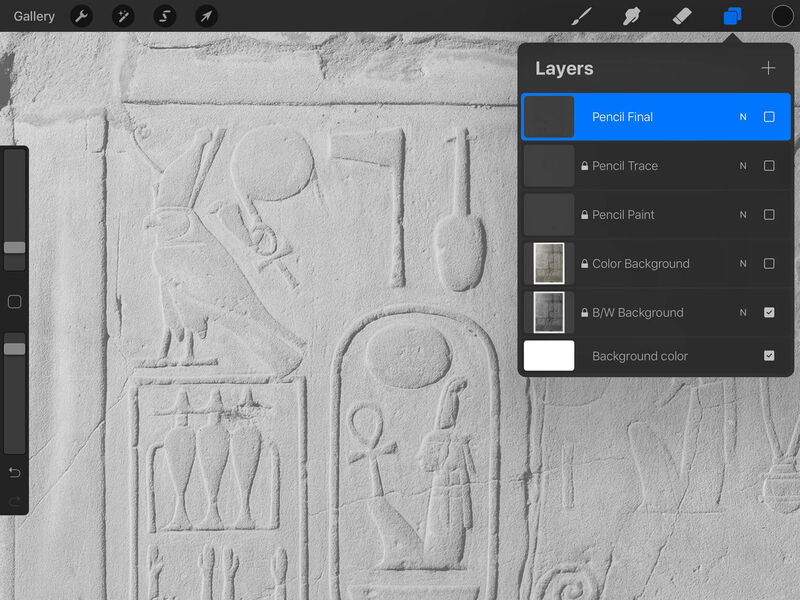 (1)The desaturated, black and white version of the original background is ideal for capturing carved remains, while the color background remains indispensable for recording traces of paint. (2)Procreate allows a plethora of modifications to any layer; one of the most useful tweaks we often apply is a quick change of layer opacity, which can be achieved by touching the layer with 2 fingers and sliding your finger horizontally afterwards. 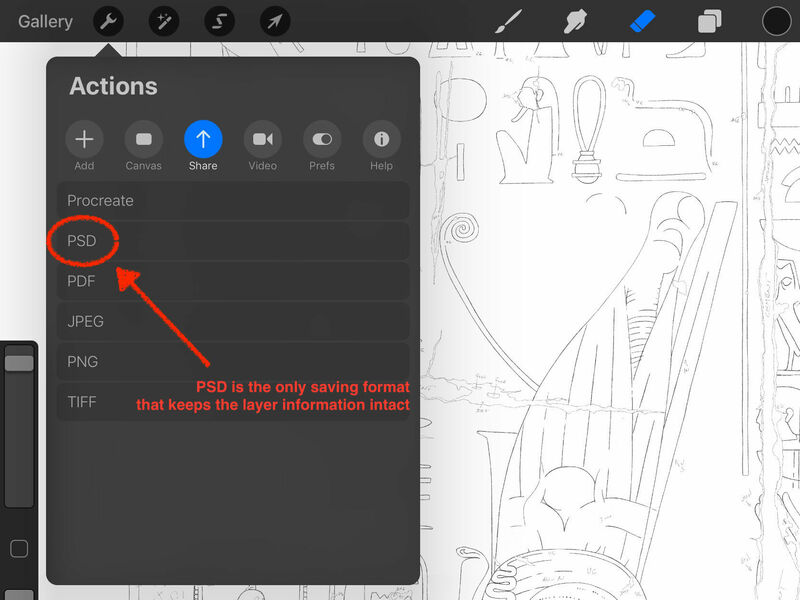 (3)The number of necessary layers needs to be factored in when background image resolution is established, because the larger our image, the fewer layers we can add to our Procreate file. 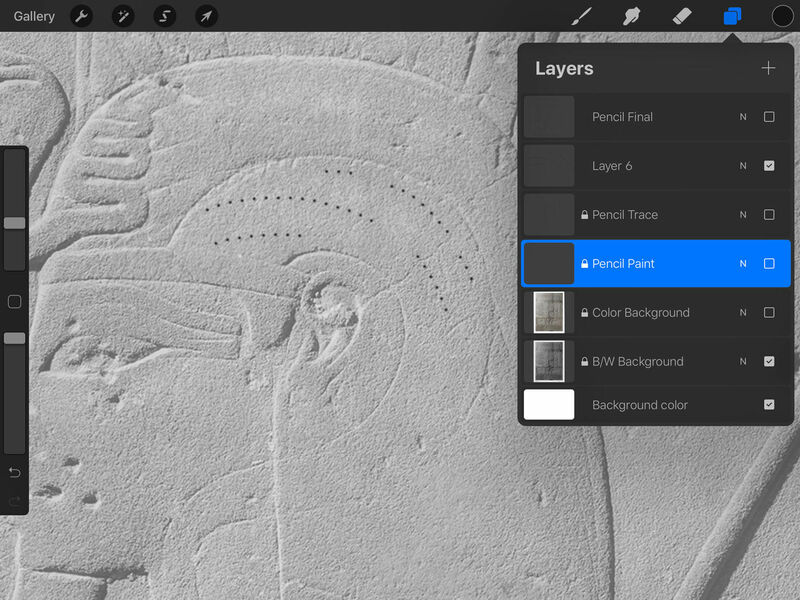 (4)Although each assignment can have its own set of specific brushes designed, the Epigraphic Survey aims to unify its digital toolsets in the same manner as has been established for the traditional Chicago method. 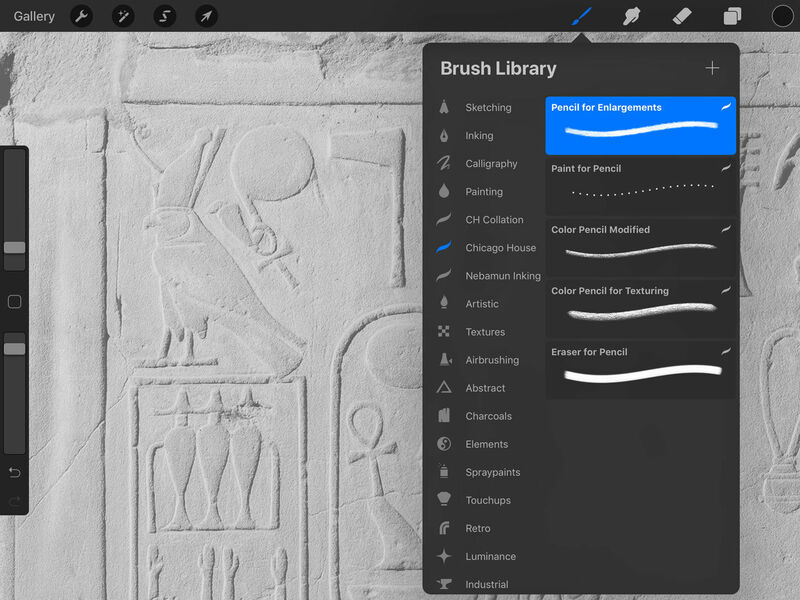 (5)Procreate provides a large arsenal of adjustments for each brush, with one of the most essential of them being the StreamLine slider, which adds some necessary stabilization to our brush strokes when working in the field. (6)Creating the initial version of LD 177, digital pencil strokes were distributed onto three separate layers relevant to their content, designated as the Pencil Final, Pencil Trace and Pencil Paint layers. (7)Graffiti were indicated on the Pencil Trace layer to record their contextual information, while a separate study was initiated to present them in greater detail with their proper transcription when possible. 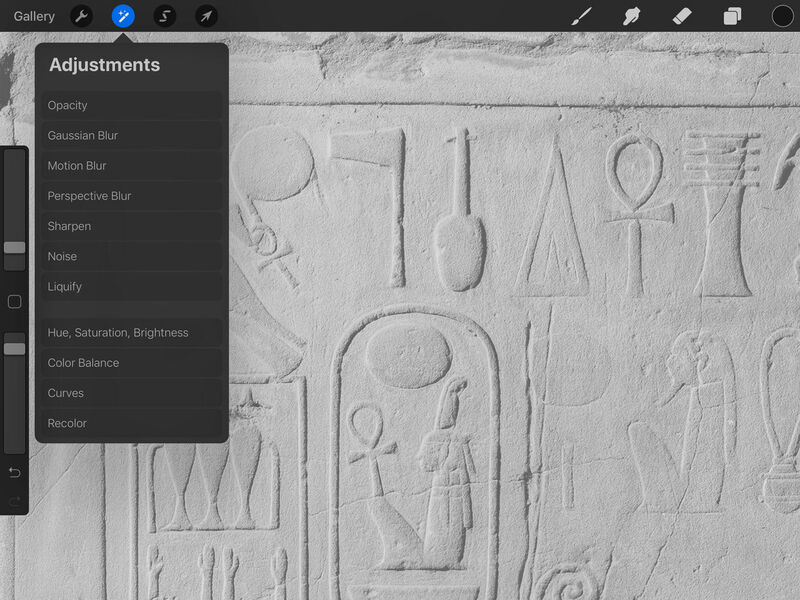 (8)Digital pencil brush strokes must be placed with great care and must be labeled with sun-shadow, etc. information accordingly, to provide the necessary quality and the right amount of data required for digital inking. 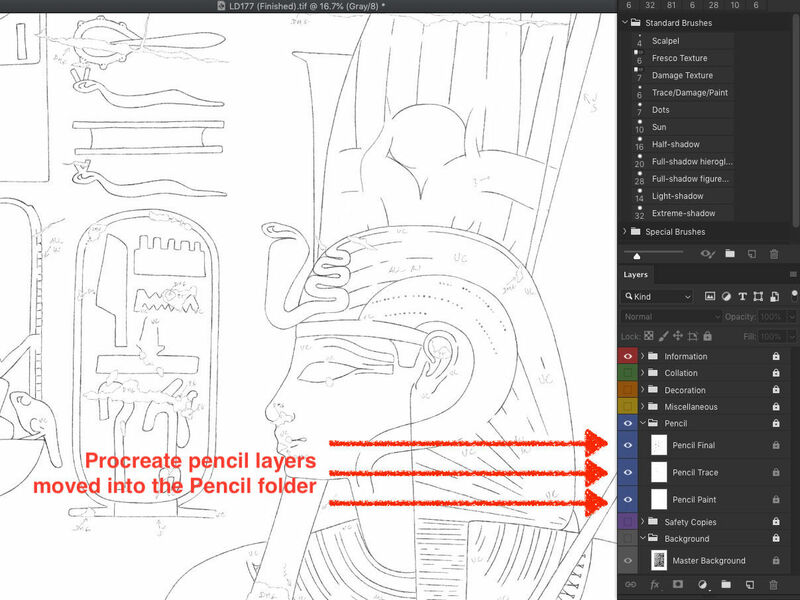 (9)Screenshot of the final digital pencil drawing, showing a larger penciled area with all the pencil layers turned on. The file needs to be exported out in PSD format in order to preserve layer information. 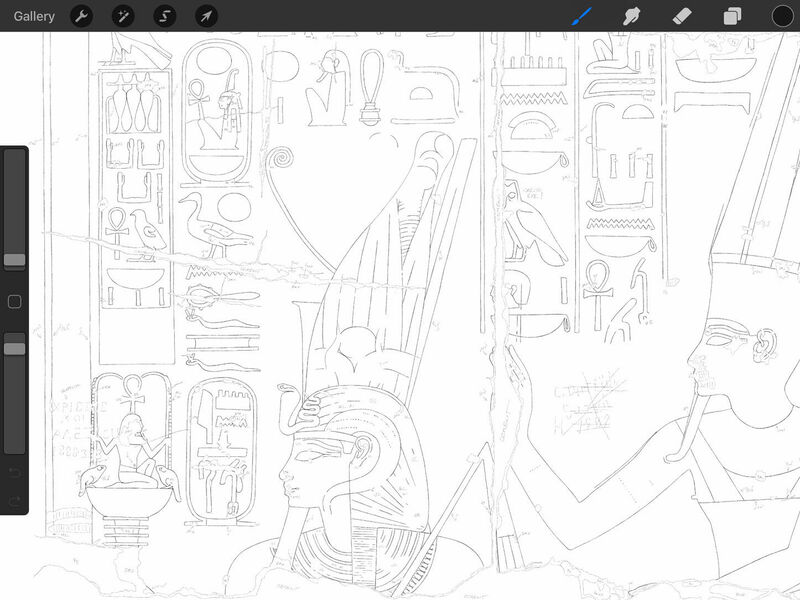 Penciling LD 177 in Procreate took a total of 123 hours, spread out over approximately 20 workdays at Luxor temple. Once the digital pencil drawing was finished, the file needed to be exported from Procreate so as to be made part of the template once again for digital inking. The file was transferred as a layered PSD file using iTunes and imported to the LD 177 Master Image file. After initiating the above process, the PSD file was opened in Photoshop along with the LD 177 Master Image, and the four appropriate layers (Pencil Final, Pencil Trace, Pencil Paint and the background image to assist with alignment) were moved into the Background folder. Once the four new layers were selected and made transparent (Layers/Multiply), they had to be scaled up to 400% (Edit/Transform/Scale@400%) for an exact match with the original 1200 dpi background. Now, with the Snap function turned on in Photoshop, the new layers (still selected together) could easily be moved to their proper place (View/Snap/Snap to/Document Bounds). The key element for this process is to keep the 4 layers’ relative alignment intact, so one can temporarily link these layers for easier layer management while executing the scaling and moving tasks (CMD+Select Layers, Right Click, Link Layers). 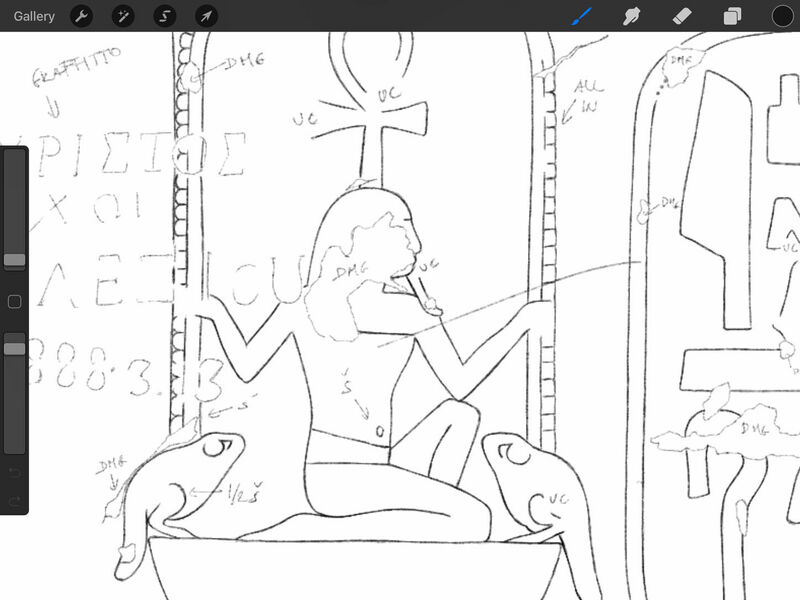 As soon as the Procreate reference background image (along with the upscaled pencil layers) was properly aligned with the Master Background, it was not needed anymore, so it could be deleted. As a final step, the three pencil layers were placed in the Pencilfolder. LD 177 was now ready to be taken to the next step, digital inking. No specific comments yet, but very happy to see this hugely interesting website is available. Dear Willem, thank you so much for your kind words and your interest in digitalEPIGRAPHY! We wish you happy reading on our site and please, let us know if you have any questions or suggestions about the subject.